Take a break from technology for a while, grab your all-time favourite children and young adult books and read to your kids! Reading enhances knowledge and entertains the young ones, and more often than not, children’s books contain moral and educational messages hidden in the storyline. Here are 10 new and classic books to read with your kids to nurture young minds and imaginations with magic, adventure, and fables. Wilbur is a pet piglet of Fern Arable, whose father spared him from being slaughtered. When the little pig grew up, he was sold to Fern’s uncle, who kept him in a barn with no other companion. Wilbur befriends Charlotte, a spider who resides in her web at the barn, watching over the new pig. When they find out about the uncle’s intention to cook Wilbur, Charlotte promises to come up with a plan to save his life. James is a 4-year old who lives with his two mean aunts, Spiker and Sponge, after a Rhinoceros killed his loving parents. For three years, the two ladies mistreated James and forced him to sleep in the attic. One day, the boy met a mysterious old man who gave him some extraordinary aloe vera — which will bring happiness and a great adventure when consumed. On his way back, James accidentally dropped the magical plant onto a peach tree, and it produced a peach as large as a house. What could be inside the giant peach? Jacky Ha-Ha is a 12-year old girl loves to crack jokes and make everyone around her happy. Little did they know, Jacky has worries too — in particular, her mother who is serving the army in a country far away and her father who she hardly sees. One day, Jacky made a promise to keep her family together, even if that means giving up the one thing that makes her happy. Will she still be the Jacky that everyone loves? “I can’t” and “I wish I had talents” may be the words children (and adults) say whenever they feel unaccomplished. But what does it really take to become a champion? Passion, hard work and dedication made Michael Jordan the basketball hero the world loves today. The inspirational storybook was written by the athlete’s mother herself to encourage children all over the world to follow their dreams. Adri is a young rockfish who is ready to explore the ocean. His parents shared some knowledge and wisdom that they have gained throughout the years. The simple words of mama and papa rockfish gave Adri the guide and comfort he needed to kick start his adventure. There is only one you in this world — make a difference! A puppy or a kitty? The picture book by Dr Seuss tells the story of our childhood dilemma in rhythms. A pair of siblings goes to a pet shop to choose their first pet. Brother likes the pup and sister have her eyes on the kitten, but Daddy said they could only pick one. How would the two siblings resolve this? Which pet will they choose? It’s Sophie’s first day at school and many kids were laughing and running around. Her mommy and daddy said she would make friends and have lots of fun, but Sophie felt otherwise – the chairs were uncomfortable, the milk wasn’t tasty, and no one appreciated Bonnie and Baxter, her two squash best friends. Will Sophie be happy in her new school? Nari’s dad couldn’t walk since he was young. Whenever he and Nari go to the park, he often apologises to her for not being able to skate, bike, and run. But that’s okay — Nari enjoys looking at the flowers, patting a cat, and staying by her wheelchair-bound father’s side. A truly heartwarming story about love and acceptance that can teach your child the joys and comfort of family. Dorothy tried to run away from home with her dog, Toto. She met a Professor Marvel, a kind fortune teller who tricked her into thinking that her aunt is ill so Dorothy sould go home. But on her way back, a strong tornado blew her and Toto away. The two were teleported to the land of Oz, where they met many friends and went on an adventure to fight the Wicked With of The East. A fantastical tale with lessons on bravery and loyalty you can teach your child to apply to real life! Originally written in 1719, the classic tale of Robinson Crusoe’s adventures in an exotic island where he was swept ashore after a massive storm is given new life in an animated film due for release on 4 August! 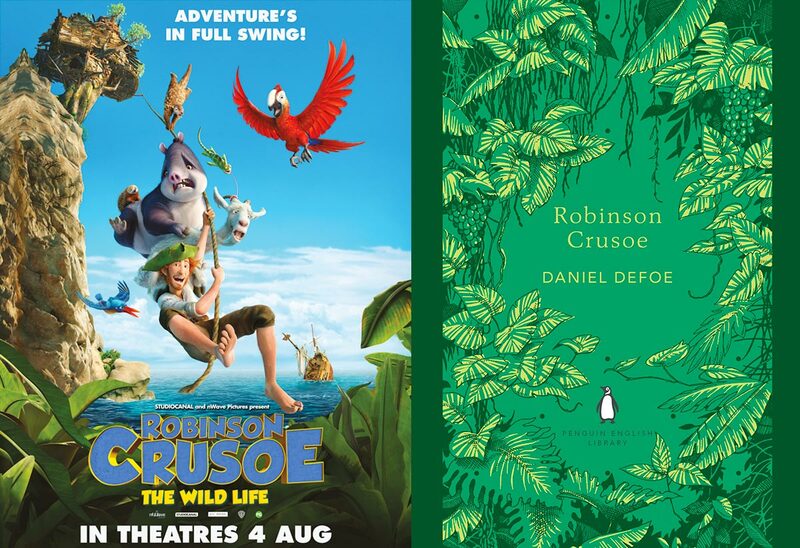 Told through the eyes of Tuesday the parrot and his other animal friends, the story of Crusoe has hilariously been remade with these adorable animal characters that are curious about the newcomers to their island. Even though they initially found Crusoe and his dog strange and “hideous”, curiosity turns into acceptance, and Crusoe and the animals soon find themselves living quite harmoniously. When this newfound peace is threatened by savage cats, will Crusoe and the island’s natural inhabitants be able to work together to reclaim their little paradise? Read the book and watch the movie with your little ones and see if you can play a fun little game of spot the difference. There are plenty of lessons on friendship and bravery in this one, so don’t miss out on this classic tale! Opening in cinemas on 4 August, this is the perfect weekend movie to catch with the whole family.